With the release of IRON MAN 2 only weeks away, these two back issues of Iron Man will be on the rise. These two issues have already begun to trend higher in value as both books saw an increase in the last few weeks. Iron Man #118 features the first appearance of Jim “Rhodey” Rhodes into the Iron Man Universe. Originally this issue booked at less than $ 4, but its value for a near mint copy can now fetch $ 20 or more. 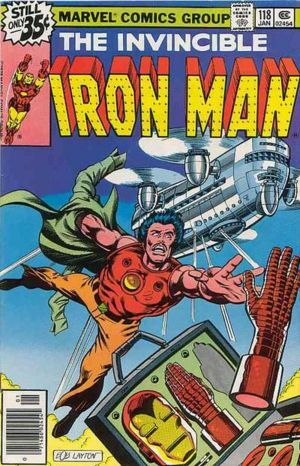 Released in 1979, Iron Man #118 is a great issue for those collectors interested in Iron Man. Story by David Micheline, and art by John Byrne and Bob Layton. As we get closer to the release of IRON MAN 2 this book may continue to increase in value. Iron Man#282 features the first appearance of War Machine. Booked last year at $ 5, its value for a near mint copy is now in the $25 range. With Don Cheadle set to suit up as War Machine in IRON MAN 2 this book is hot! Released in 1992, Iron Man #282 is written by Len Kaminski and pencilled by Kevin Hopgood. A must have issue for any Marvel Comics’ collector.